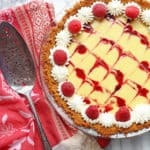 Raspberry Key Lime Pie (Best Key Lime Pie Recipe) - Raspberries get swirled through a lime flavored custard in a delicious spin on the best key lime pie recipe. Mix together graham cracker crumbs, melted butter and sugar in a bowl. Pour the mixture into a 9 inch pie plate and press down into the plate and around the sides. Bake for 10 minutes to set. Whisk together egg yolks, key lime juice, condensed milk, and vanilla extract. Pour filling into baked pie crust. Next carefully spoon drops of melted raspberry preserves (make sure they are just melted) over filling. Using a butter knife or skewer, drag the knife through the drops creating a swirl pattern in the filling. Bake for 15 minutes until set then let rest until it cools to room temperature. Refrigerate for 2-3 hours, garnish with whipped cream and berries if desired and serve.